Hape, a leading worldwide toy manufacturer, has announced the winners of their trip to China for ASTRA retailers. 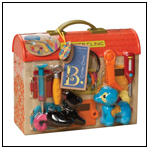 Hape selected two winners: Bellevue Art and Frame of Bellevue, WA and Geppetto’s Toy Box of Oak Park, IL. The winners will join Hape on an all-expense paid trip for two to the cosmopolitan city of Shanghai and Hape’s production facility and bamboo conservancy in Ningbo. Winners will visit Hape’s state-of-the-art manufacturing campus, which produced over 8.6 million toys in 2011. “The entries we received genuinely showed a 100% commitment to the Hape brand and for that we are extremely grateful,” says David Quercia, vice president of Hape. The winners were announced on Monday, June 11th at ASTRA Marketplace in Baltimore. Eric and Brandy Masoncup of Geppetto’s Toy Box focused on communicating 5 Reasons to Love Hape and incorporated Hape’s whole child philosophy, socially responsible practices, the environment, pioneering innovation and use of sustainable materials in toys in their expansive window display. They also enthusiastically promoted Hape through social media efforts. Robin McClane, owner of Bellevue Art and Frame and her staff created a 22 foot beautifully merchandised Hape shop-in-shop using shelf strips and branded signage. They also assembled and displayed several products for parents and gift givers to allow them to see the level of detail and quality in Hape toys firsthand. More than 60 ASTRA retailers competed for the chance to win the trip. It required creation of the store’s best four foot section of Hape merchandised product. Hape, (Hape pronounced “hah-pay”), founded by Peter Handstein, was established in Europe Switzerland 26 years ago. Hape is able to produce the highest standards of quality through stringent control systems and a world class production facility. Hape brands including Hape®, Hape Collection, Quadrilla®, and Beleduc are sold through specialty retail, museum gift stores, school supply stores and select catalog and internet accounts in over 50 countries. They have won numerous awards from prestigious independent toy testing groups for toy design, quality and safety. Discover more at www.hapetoys.com.